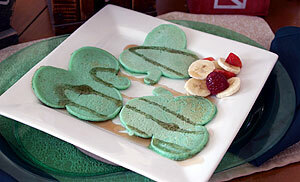 Thanks for the green St. Patty's Day pancake idea! The kids (supervised) made the pancakes themselves! It was simple and fun. We had them for dinner and everyone loved it, because nobody really wanted to have green eggs. Yuck. Thanks for sending the idea out even though you thought it was too late. It wasn't , and we even gave the school cook an idea for next year! Start out the day right and get into the spirit this St. Patrick's Day! I hope you enjoy the clover pancakes!